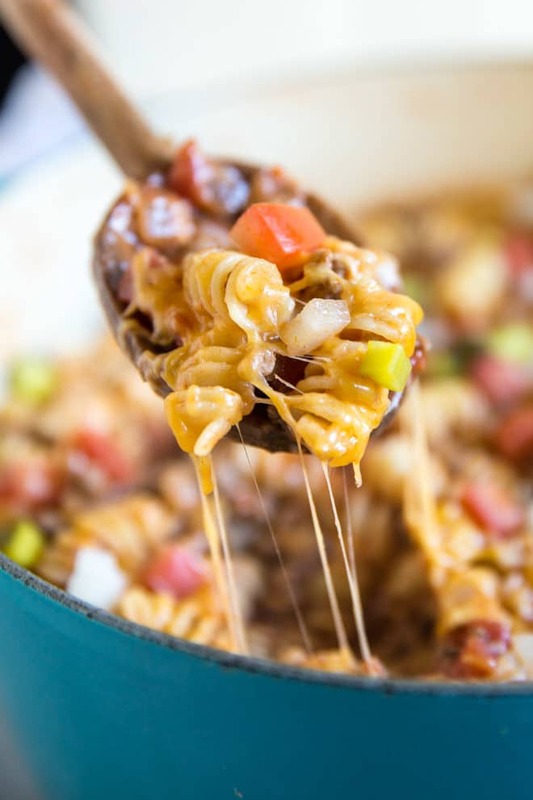 This easy One Pot Cheeseburger Casserole is the ultimate comfort food! 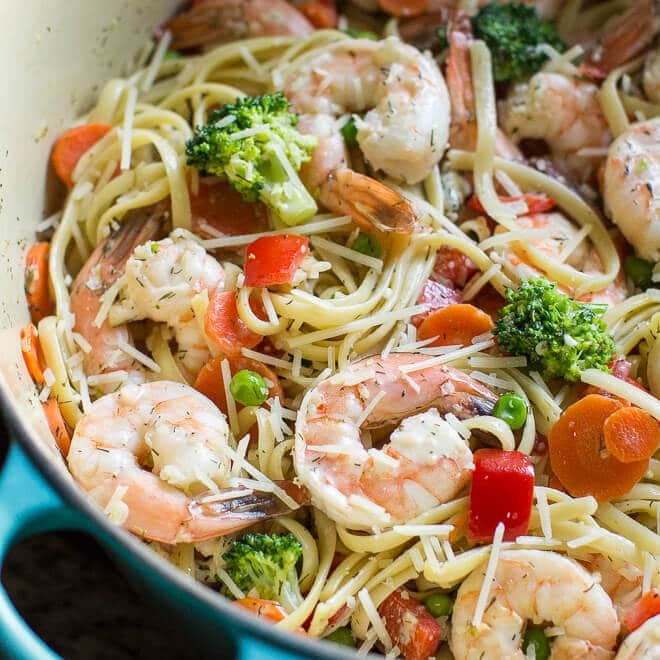 Best of all, it comes together in one pot, on the stove top, in 30 minutes or less. 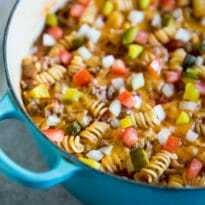 Cheeseburger Casserole combines the tasty elements of classic comfort food with the convenience of modern stove-top one-pot meals. 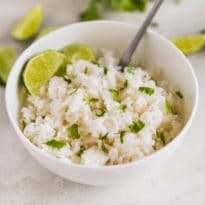 Once the meat is browned and drained, the noodles go uncooked right into the pot along with enough sauce ingredients to bring the whole dish together. Garnish with fun burger toppings like tomatoes, onions, and pickles for a delicious and satisfying meal the whole family will love. Start with two pounds of ground beef and brown in a Dutch oven or stock pot. I like to add onion to the beef while it cooks and save some raw onion for garnishing at the end. Drain the beef and onion if you want to. There is a lot of flavor in the fat, but everyone has their own tolerance to the greasiness of food. Next, stir in the sauce ingredients, water, and pasta. Cover and cook until the pasta is cooked through, about 13 minutes. Finally, choose your favorite burger toppings to garnish this casserole! Along with an extra layer of melted cheese on top, I love Cheeseburger Casserole with pickles, onions, and tomatoes. 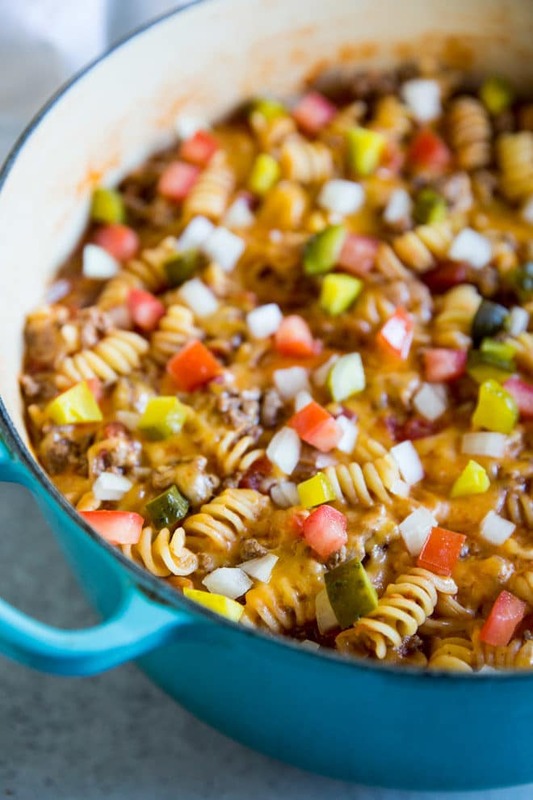 Save this One Pot Cheeseburger Casserole to your “Main Dishes” Pinterest board! In a Dutch oven or stockpot over medium high heat, add ground beef and onion and cook until beef has browned, about 3-5 minutes, breaking up any clumps with a wooden spoon. Drain well if desired. Stir in tomatoes and juice, broth or water, pasta, tomato sauce, ketchup, and mustard. Bring to boil. Reduce heat, cover, and simmer until pasta is cooked through, about 13-16 minutes. Remove from heat and top with cheese. Cover until cheese has melted, about 2 minutes. Garnish with tomatoes and pickles, if desired. 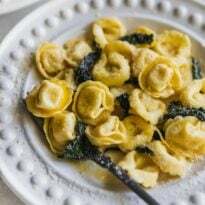 For those who want to make this with gluten-free pasta, cook it al dente first then add it. Or stir it in before adding the cheese. If you add uncooked gf pasta to what amounts to a slow cooker environment you will have a casserole with one pound of wallpaper paste in it. It CAN NOT be rescued. Don’t ask me how I know this. Lol. PS. This was experienced on a different recipe, not this one.